November is “National Prematurity Awareness Month” (Nov. 17 is “World Prematurity Day”).There are nearly a half million babies born prematurely in this country every year. Anne had it all. She was a physician, an Army officer, and a great wife. She’d be a great mom, too. But the joy of pregnancy is short-lived after an ultrasound reveals that Anne isn’t just pregnant, she’s really pregnant – with quadruplets! Four Before Their Time is the true story of four babies surviving on a razor’s edge, one mom’s overwhelming and guilt-ridden entrance into parenthood, and an entire family’s experiences with extreme premature birth. It will take all the faith, hope, and resilience the Spillane family can muster – along with more than a few miracles – just to get the quadruplets home. Four Before Their Time is available at Amazon. Q: Thank you for this interview, Tim. Can you tell us what your latest book, Four Before Their Time: A Story of Hope, Resilience and Miracles, is all about? A: It’s a family memoir. Our daughter Anne is a physician, an Army officer and a great wife. We knew she’d be a great mom, too. But the joy of pregnancy is short lived when she learns she isn’t just pregnant, she’s really pregnant – with quadruplets. 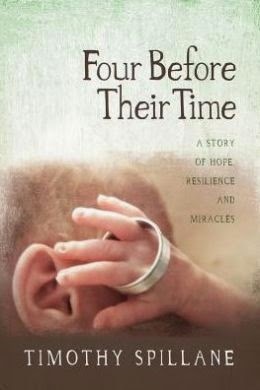 Four Before Their Time tells the gut-wrenching story of my four grandbabies’ struggle to live, my daughter’s guilt-ridden entrance into parenthood, and our entire family’s experiences with extreme premature birth. Ultimately, it’s a triumphant story of love and survival that is almost too remarkable to believe. A: Well, I wouldn’t have picked this experience for my family if I had a choice. But I wouldn’t trade what we’ve gained through this journey for anything, either. A: There was an amazing amount of medical detail to sort through. I avoided it as much as possible while the babies were in the midst of their worst struggles. It was my coping mechanism. But to tell the story I knew I’d have to get a good grasp on what exactly they endured. Fortunately, two of our daughters are physicians and my wife is an EMT. They were an invaluable resource. A: Hang onto hope. When it slips away, grab for it again. Miracles come from doing that. “I don’t know exactly when it happened, only that it did. It wasn’t miraculous. I didn’t see God walking in the corridors of Wilford Hall [Hospital], just Timmy, Edda, Lily and Wyatt resting peacefully in their cribs one afternoon. Looking down at them I saw for the first time what God must have always seen in me. And what I saw was nothing. These tiny lives lying helpless in the NICU possessed nothing; prostrated, they could offer nothing; their only hopes were those given to them by others. Pitiable as they were pathetic at birth, their condition desperate as it was wretched, they could no more conceive of what they needed than they could ask for it. The wonderful paradox was although there was nothing the babies could do to make me love them there was at the same time nothing they could do to make me stop. Realizing that truth led to another: I could never love the babies in the way I did except that God had loved me like that first. As surely as His eyes were on Timmy, Edda, Lily and Wyatt, they had also always been on me. He saw my life no differently than I did theirs: lying helpless before Him I possessed nothing to gain His love, prostrating myself I could never merit it, forlorn of hope I could not even conceive of the possibility that He loved me. A: We contacted scores of agents without any success. In the end, I decided our best route was to self-publish. I’m glad I did. Good stories need to be told. I believe this story had to be told. A: I’ve recently shuttered my construction business that I’ve owned for 25 years. It’s given me tremendous flexibility to work on this book. But I miss the routine that I’d known for so long. Being an author can leave you on something of an island. I don’t really have “typical” days anymore, and that can be unsettling. A: I’m thinking about writing a children’s book – a book that parents of premature babies can read to their children during those long, scary days in the neo-natal intensive care unit. I write in my book about reading to my daughter’s babies while they were still in her womb. The story I read them – Annie Proulx’s wonderful short story, Deep-Blood-Greasy-Bowl – was hardly a children’s story, but I believe that sharing it created a bond between us. And my daughter loved that I did it. Q: Thank you so much for this interview, Tim. We wish you much success! Tim and his wife live in Chester County, PA and are the parents of three daughters. They became grandparents when their daughter, Anne delivered quadruplets in April, 2010. A graduate of Colorado College (1979) with a degree in English Literature, Tim returned to school to earn his Masters of Public Health from Drexel University in 2005. He has worked in residential construction for more than three decades but is now focusing full-time on his writing. He currently serves on the executive board of Graham’s Foundation, an organization for parents and families going through the journey of prematurity.